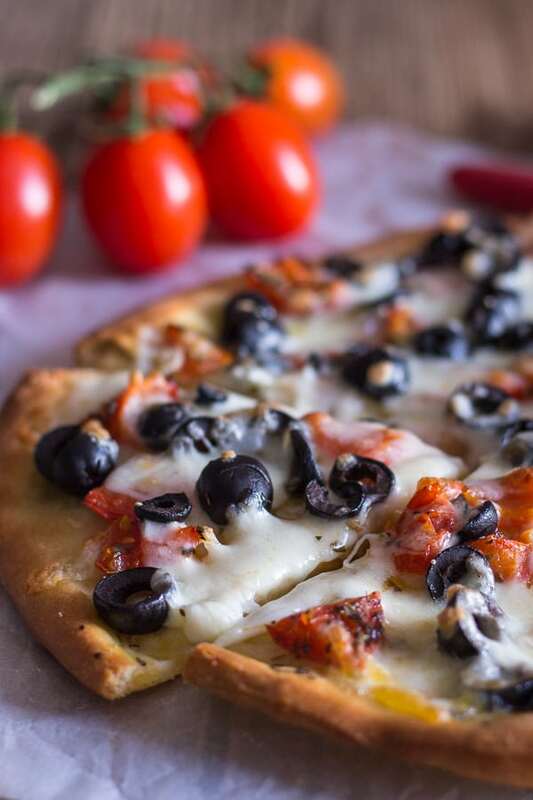 There’s nothing like Homemade Pizza, especially when it is made with fresh tomatoes. 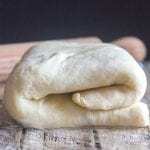 A delicious pizza made with homemade pizza dough or even store bought dough. Top it with shredded mozzarella and some sliced black olives. The best pizza I ever had was at my mother-in-law’s brother’s house. 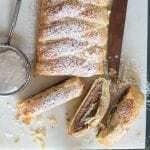 My husband, our 2 daughters and I usually go visit them at least once a year in Frosinone. My husband’s mother was born there, but moved to another area called Castelli Romani as soon as she got married. My husband has always been very close to his uncles and after meeting them I understood why. They are very warm and welcoming people, just how Italians are always described. So whenever we go there, we usually stop by at one uncle’s house first for lunch and then the other for dinner. Those days always end up being the best ones for us. We spend it with great people, sipping wine, indulging in delicious delicatessen alla “casareccia” (which in Italian means “homemade”) and by the time we finish eating we realize how late it is and have to get back into the car and drive home. So this one Sunday, when we arrived at Uncle #2 for dinner, the wood-burning stove was going and that could mean only one thing, that something amazing was being prepared. If you’ve never eaten a Homemade Pizza made in a wood-burning oven, trust me, buy one, find one, go to Italy, anything ! But at the top of Bucket list has to be – eat a pizza made in a wood-fired oven. I’m sorry to say, my Homemade Pizza Recipe was not made in a wood burning oven, but it turned out pretty darn good anyway. 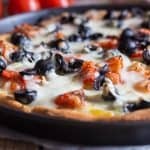 More Pizza Recipes you may enjoy! 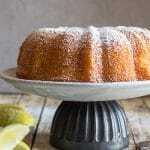 I believe a lot has to do with all the fresh ingredients I used. I always made my sauce from a can or bottle, (which in the winter has to suffice), but once i tasted those fresh tomatoes with fresh basil and mozzarella, there was no going back. First thing choose your dough, you can make your own which is the best if you have time, and this Best Pizza Dough is our favourite. But if time is short and you want pizza, store bought or even your favourite bakery or pizzeria may have their own dough that they sell. The best way to make it Homemade with store bought dough I found is to knead it back into a ball, cover it with a towel and let it rest for 30 minutes, then form into your pans. For the fresh tomato topping I like to use either Roma or grape tomatoes, remove the seeds and chop them up. Use as many fresh ingredients as possible, fresh basil, olive oil, a little oregano and salt. Bake it and then add the shredded mozzarella and black olives and bake just until the cheese melts. 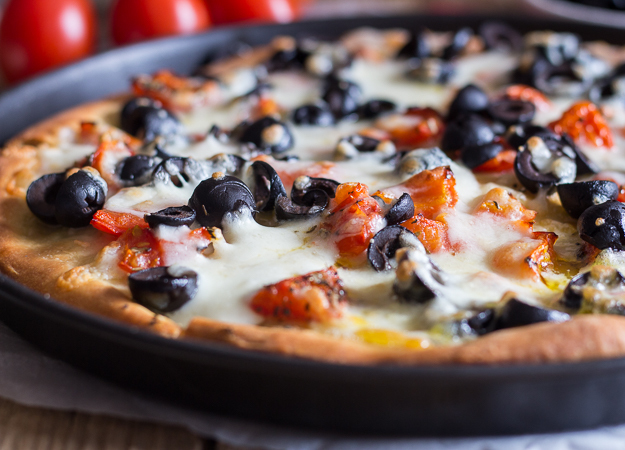 The best tomatoes to add-on top of the pizza are cherry tomatoes or plum tomatoes. Nice, ripe, fresh tomatoes. 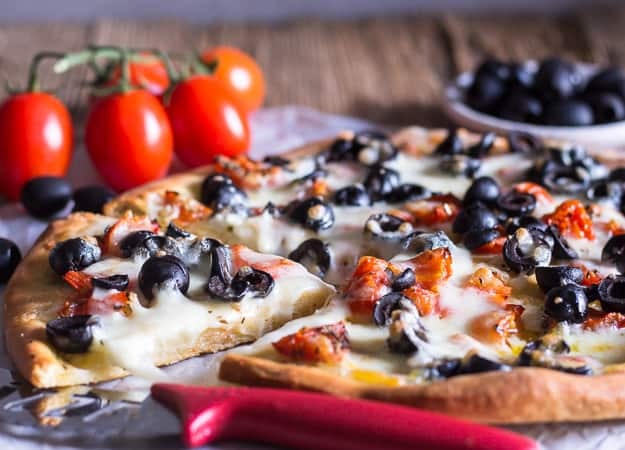 Add a few black olives if you like, open a bottle of vino, enjoy your Homemade Pizza with Fresh Tomatoes, and as the Italians say Buon Appetito! 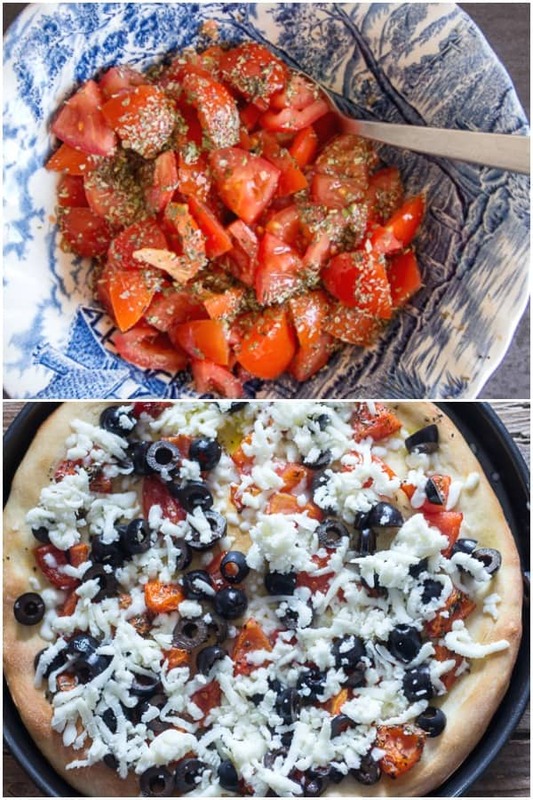 There's nothing like Homemade Pizza, especially when it is made with fresh tomatoes. 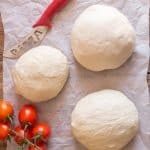 A delicious pizza made with homemade pizza dough or even store bought dough. Top it with shredded mozzarella and some sliced black olives. Pre-heat oven to 450° (250° celcius), drizzle a 12" (30 centimeter) round pizza pan with a little olive oil. 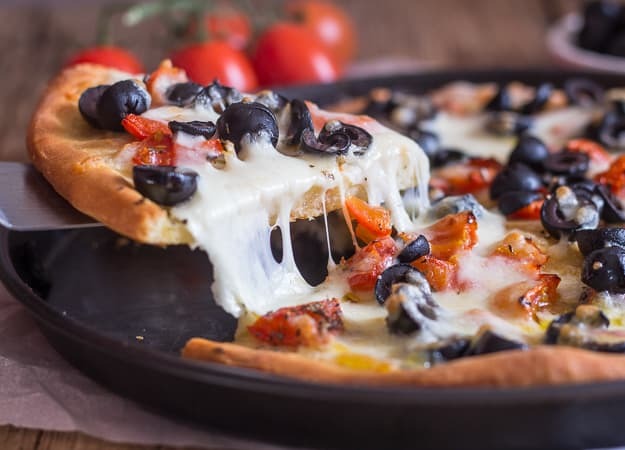 Top the pizza dough with the tomato mixture, bake in pre-heated oven for approximately 10-12 minutes, remove from the oven and top with olives and grated mozzarella, return to oven and continue to bake for another 3 or 4 minutes until cheese has melted. Remove from oven, slice and serve. Enjoy! When you refer to ” black olives ” , do you mean ,or prefer a particular type of black olives. Hi Thomas, I usually just buy a jar or a can of plain pitted black olives in brine (I slice them myself) although once in awhile I will by some from the deli section. And thank you, glad you enjoy the recipes. Have a great weekend. Hi, I think you should too, it is really good and so easy, let me know how it turns out.